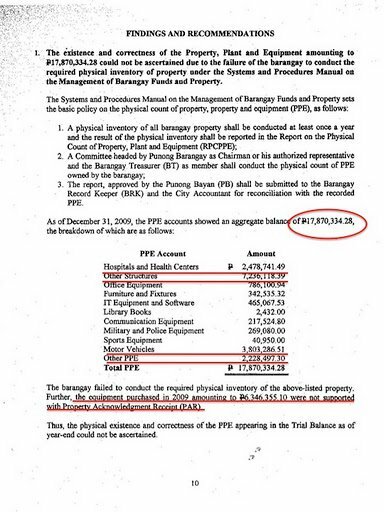 Barangay Ayala Alabang officials misused funds? With the barangay elections over, allegations of major graft and corruption have come out in the upper middle class communities of Bel-Air and Ayala Alabang. The alleged misappropriation of funds in Bel-Air by the previous barangay captain has caused such a major stir that the campaign was marred by name-calling and hysteria. At Ayala Alabang, the Commission on Audit has found alleged major irregularities of close to P50 million. They say the conscience of a nation belongs to the middle class and in fact People Power 1 and 2 were both mostly led by the middle class society. Alabang Bulletin did get some info regarding this a day before the elections but we opted not to put them here until we verified them and until we heard the other side. With the elections done and the results already in, we can now post the pictures sent to us by concerned residents of Barangay Ayala Alabang. Well, like what Mr. Romualdez said in his column, if this is true, then who can we trust now? If this is not true, can anyone explain what happened here? Next story Alabang Hills Got Talent? Let’s find out!